Property 16: Appt town center 65m ². Beautiful view of the mountains. Ideal 5 pers. Property 20: Studio independent full foot in Villa. 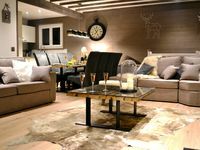 Property 40: SUPER BOLQUERE new chalet lightfull sunny glass, stone and wood. Property 50: duplex south facing apartment with balcony and garage and front location.